My name is Russell David Lewis. All my life, I’ve experienced joint subluxations in every joint, and complete joint dislocations frequently in 36+ joints due to Ehlers Danlos Syndrome – The Hypermobility Type (EDS-HT). At a young age, I had to learn how to relocate my joints. 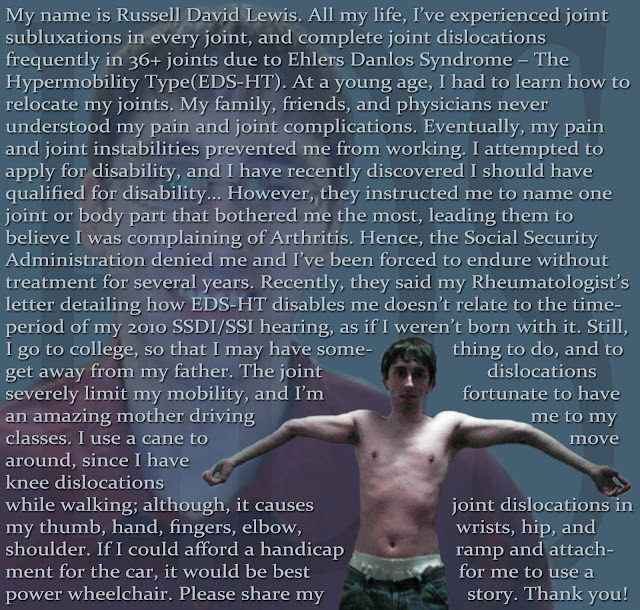 My family, friends, and physicians never understood my pain and joint complications. Eventually, my pain and joint instabilities prevented me from working. I attempted to apply for disability, and I have recently discovered I should have qualified for disability… However, they instructed me to name one joint or body part that bothered me the most, leading them to believe I was complaining of Arthritis. Hence, the Social Security Administration denied me and I’ve been forced to endure without treatment for several years. Recently, they said my Rheumatologist’s letter detailing how EDS-HT disables me doesn’t relate to the time-period of my 2010 SSDI/SSI hearing, as if I weren’t born with it. Still, I go to college, so that I may have something to do, and to get away from my father… The joint dislocations severely limit my mobility, and I’m fortunate to have an amazing mother driving me to my classes. I use a cane to move around, since I have knee dislocations while walking; although, it causes joint dislocations in my thumb, hand, fingers, elbow, wrists, hip, and shoulder. If I could afford a handicap ramp and attachment for the car, it would be best for me to use a power wheelchair. literally a pain in the whole life and great to hear your story too on here and lovely to see jess doing the write ups. keep positive, strong, try always keep a smile even though inside its upside down.